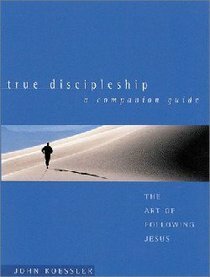 In "True Discipleship" and its companion guide, Koessler provides a straightforward presentation of the characteristics Jesus laid out for His disciples. As the author offers teaching on the practice of discipleship and the responsibility of being a disciple, readers can be stretched in their thinking and encouraged in their journeys. - Publisher If we truly believe Jesus Christ is not only the Son of God, but also our Savior and Lord, it is reasonable for others to expect to see proof of our commitment to Him in the way we live. That evidence is what biblically-minded Christians call discipleship. "Discipleship is faith expressed in real life, every day, in every way," writes noted author and lifelong disciple John Koessler. But there is more to it than merely watching your language on the loading dock or dropping a few coins in a charity donation box. In this companion guide to John Koessler's contemplative and practical book, True Discipleship, you'll explore through in-depth study of Scripture passages. You'll find this guide invaluable for your personal Bible study ... and you might find this study so revolutionary that you'll want to share it with fellow believers in a small group setting, too! Book jacket. Most of us would answer 'No' when asked if we were like Jesus. How do we become more like Jesus? John Koessler believes the answer is by understanding and developing the marks of a true disciple in our lives. In True Discipleship and the Companion Guide, he provides a straightforward presentation of the characteristics Jesus laid out for His disciples. As he offers teaching on the practice of discipleship and the responsibility of being a disciple, readers will be stretched in their thinking and encouraged in their journey. About "True Discipleship (A Companion Guide)"
If we truly believe Jesus Christ is not only the Son of God, but also our Savior and Lord, it is reasonable for others to expect to see proof of our commitment to Him in the way we live. That evidence is what biblically-minded Christians call discipleship. "Discipleship is faith expressed in real life, every day, in every way," writes noted author and lifelong disciple John Koessler. But there is more to it than merely watching your language on the loading dock or dropping a few coins in a charity donation box. In this companion guide to John Koessler's contemplative and practical book, True Discipleship, you'll explore through in-depth study of Scripture passages. You'll find this guide invaluable for your personal Bible study ... and you might find this study so revolutionary that you'll want to share it with fellow believers in a small group setting, too! Book jacket. John Koessler has written for Discipleship Journal, Leadership, Moody Magazine, Decision, and Christianity Today. He has served as a pastor and currently is chair of the pastoral studies department at Moody Bible Institute in Chicago. He is the author of several books including True Discipleship and God Our Father. He holds degrees from Wayne State University, Biblical Theological Seminary, and Trinity Evangelical Divinity School. He has made numerous radio and television appearances. He lives in northern Indiana with his wife and sons. lesson 1: What Is "spirituality"?